Quinn Weller is a sous-chef at a trendy restaurant in Los Angeles. Still grieving from the loss of her sister two years ago, Quinn gets visited by a lawyer. He drops a life-changing bombshell on her. What follows is a journey of self-discovery and adventure in the little town of Wildstone. Quinn’s life will never be the same again. When a lawyer delivers earth shattering news to Quinn, she begins to question her whole life. With a young sister she was unaware of, Quinn has her work cut out getting to know her. She feels torn going back and forth between Los Angeles and Wildstone. A chance meeting with an attractive stranger, Mick, has her all a flutter. The chemistry between Mick and Quinn is undeniable. I imagined Mick to look like Luke from the television show, Gilmore Girls. I’m sure that’s nothing like Jill Shalvis intended, but it worked for me! I fell in love with his character and was rooting for him and Quinn all the way. The tender scenes between them were beautiful. Neither Quinn nor Mick have plans to stay in Wildstone, despite both having family there. This leaves a constant question over their future together. There is also the matter of Mick’s ex-girlfriend, Lena. A determined and confident woman, she tells Quinn that she wants Mick back and that she will get what she wants. It made me dislike her character, but Quinn handles the situation very well. Shalvis then spins your emotions and the situation that Lena is in, and you begin to feel a little sorry for her. I loved Quinn’s first meeting with the lawyer, Cliff Porter. She renames him Harry Potter (in her head) due to the uncanny resemblance to the boy wizard. It did make me chuckle. Tilly’s character is wonderful. A young, yet wise, teenager. Her life has been ripped apart by the death of her mum. Looked after by a family friend, Tilly is finding life tough. All she has in the world is her best friend, Dylan. It took me a while to warm to Dylan’s character. After learning of his background and home life, I saw him in a different light. As his character evolved, so did my opinion of him. Keep your eye out for two characters who deserve a special mention – Tink the cat, and Coop the dog. They both provide amusement. Having cats and a dog myself, I know that these two characters are very realistic! The quiet setting of Wildstone is different to that of bustling Los Angeles and I didn’t like it to begin with. I could see why Quinn was looking to return home once she’d tidied things up in Wildstone. Wildstone seemed dated and the locals all had a much slower pace of life. Even I found it frustrating! But, like Quinn, I soon began to enjoy it. She then finds herself divided between returning to Los Angeles and staying in Wildstone. Quinn has formed strong connections in both places. She knows that wherever she chooses to stay, she will be leaving people behind that she loves. I liked the quirky headings of the chapters. Each one is a small excerpt from ‘The Mixed-Up Files of Tilly Adams’s Journal.’ The first one is “I walk around like everything is fine but deep down inside my shoe my sock is sliding off.” It speaks volumes about how Tilly is feeling in one short sentence. It makes a refreshing change to having numbered chapters. I wasn’t disappointed by this unputdownable book. 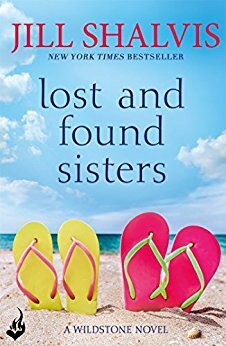 Lost and Found Sisters had so many elements to it. It was very realistic and the characters came alive in my head. I had previously read another of Jill Shalvis’ books – My Kind of Wonderful, so I knew I was in for a treat with this one – and you will be too! Have a read of our reviews of Jill’s other books:- ‘Second Chance Summer‘ – ‘My Kind of Wonderful‘ and ‘The Trouble with Mistletoe‘. This looks fun to read. I know it’s silly, but I like to read these kinds of books on the weekend. Need to look into this one. This sounds divine – I’ve actually never read this author… after reading your review I think I should.